This omni-directional TV antenna has had a slight redesign and upgrade in performance yet it has retained the essential style that is the ideal solution for any type of boat. The V9125/12 model is compact, with a diameter 250mm / 10” and manufactured with high quality materials. 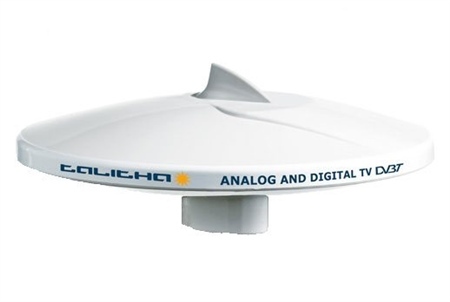 It is distinguished by a new “shark fin” design (31 mm high /1,2”) for receiving vertically polarized TV signals, that fits perfectly on the new radome with aerodynamic lines. Thanks to vertical pinnacle inside the shark fin the Talitha can receive analog or digital TV signals polarized both horizontally and vertically, meaning it is the ideal solution for any type of boat, sailboat or motorboat. This TV antenna is equipped with the 50023/98EC amplifier. If you match this with a V9147 2-way splitter, (optional) installed between the antenna the antenna and the amplifier, it will also receive AM-FM radio frequencies. The antenna comes with an Amplifier/Control, co-axial cable and TV Set cords, mount for the amplifier unit and gold plated connectors. The antenna has a moulded integral bracket, allowing it to be mounted to a pole. Having hunted trough various reviews and not being prepared to pay the extortionate price of the Nashira model by other vendors, I have settled for this one to feed our newly purchased TV. Not installed yet so the jury is out on performance once it is.